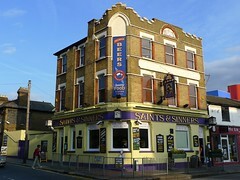 Pub near Croydon University Hospital on the Croydon/Thornton Heath border. It's quite small inside, with seating provided by three four-seater booths, several tables on a dais with padded banquettes and low backless stools, and half a dozen stools at the bar. The bar back is backlit stained glass, and an old-fashioned "time" bell with rope pull is mounted at one end photo. The floor is varnished boards. Windows are large and clear, but high up enough to give the booths privacy from the street. The decor is generally on the newer side of traditional — uncluttered but not full of hard echoey surfaces — and rather reminiscent of pubs of the 1980s. Kake has visited several times now, most recently in January 2019. On a Thursday lunchtime in March 2016, there were four or five other customers in when I arrived around 12:30pm, one of them having lunch. Music was playing, not too loud but a bit incongruously poppy. Service was friendly and helpful. The tables were laid with tablemats but not cutlery, and everything seemed very clean. The situation was similar on a Thursday afternoon in January 2019, with three other customers at 2pm and Heart Radio playing. There are no handpumps for real ale, just keg taps for the usual suspects such as Fosters, Guinness, John Smith's, and so on. A large lime and soda (less than a pint, more than a half) was £1.70 in March 2016 and £1.95 in January 2019. Traditional pub food is served every day except Saturday; according to a sign in March 2016 it's available noon-9pm Mon-Fri and noon-5pm Sun. In May 2016, Kake tried the jacket potato with cheese, beans, and coleslaw (£4.59 plus 50p for having three fillings instead of two) photo. It was fine; not notably good, but generously sized and generously filled. Accessibility: A step in at both entrances. No further steps to the ladies' once you're in (gents' not checked). All the seating is either on a dais or in fixed booths. Last visited by Kake, January 2019. Opening hours taken from sign outside, March 2016. Last edited 2019-01-17 14:23:45 (version 3; diff). List all versions. Page last edited 2019-01-17 14:23:45 (version 3).